Does it look like I'm showing off to show the finished bubble dress the day after showing it in pieces? Yes? Thought so. Oops. Sorry! It is truly the quickest thing to sew though. Not necessarily the easiest, but once I'd figured out the best construction method/order the first time all the subsequent ones have been a breeze. Imaan - if you're interested I'd be happy to do a full tutorial on the onesie design. 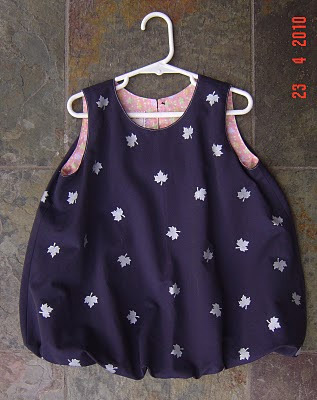 I think it's a pretty good one for beginner sewers because the modifications I made to make it easy to use also make it easy to sew, and the modifications to the pattern are pretty simple. Isabella needs another one, so I'll photograph the process as I do it. Oh, and craft punches can be found at SL, and also often at stationery shops and anywhere that sells scrapbooking supplies. Julia, you asked about my appliques. I showed how I did them in this post and this post a while back, but you've guessed correctly - it's two layers of fabric on top of the garment. You start with the garment section, place on a scrap of your contrast, followed by a scrap of your garment fabric. Then stitch the design and very carefully snip away the fabric around it, leaving more of the constrast to form a border. It's not hard, but it is a bit fiddly. Kathryn at Les Petits Anglais commented on My Favourite Book giving her problems with ease allowances. Having seen Beangirl's first efforts with the same book also give great-but-not-quite-perfect results too I'm really really really keen to hear absolutely anything either of you (or anyone else who has used it) have to say about it. I am totally in love with the book, and very very happy with the blocks I've drafted from it, and the clothing designs I've drafted from those blocks. I want to know why I'm totally happy and you aren't. (Although, Beangirl, I think you're well on the way!) Trust me, it isn't because I'm cleverer ;-) I wish the three of us could get together for a few days, ditching kids with husbands and see what we could come up with! Wouldn't that be the best fun?! Awesome! I'll be there next week. Oh wait. I have a job. Poop. (And the only person I know who is forced to allow me to stay with her in NZ-- my mother-in-law-- lives all the way up in Waiuku, so not exactly what I'd call commuter distance). Poop, again. As for the drafting thing, I wasn't disappointed really at all. I'm fairly confident the fitting issues are related to my interpretation of the instructions, not the instructions themselves. For instance, the really big tunic I made was in fact not only drafted from the "relaxed-fit t-shirt block", which presumably implies some significant wearing ease, but the example in the book is actually for a nightdress, which this would make a perfect one of. So it was more a poor choice of block than anything (which I had a fair idea might be the case, but I wanted to experiment). TLo's original sleeveles block I drafted using her exact body measurements, rather than the "next size up" on the standard charts, because she's very much not standard at all (or else I'd have to do a 140 for shoulder width, a 128 for chest width and a 110 for height, amongst other things). Using her specific measurements, the resulting sleeveless woven tunic was really a perfect fit but just had zero room for growth. It fits her Right Now, which of course isn't very practical. Also, I was curious about there being no real separation of a woven vs. a knit block and that's probably a factor. I think in a knit, that same pattern would have been ok for longer wear. Now I'm redrafting her blocks by picking her measurements off the chart and then going up one-half to one full size for that measurements only (in the width measurements, not the length) and I'm going to experiment this weekend to see what results I get from that. Judy, I would love a tutorial on the onesie (I looked up your PR review after I commented, but a pic by pic thing would be good. I am just about to trace off the 70 for my 9 month old son, and I figured, if all else fails, I will just do it with the snaps first, and then attempt it again with the crossover neck, but a pictorial would be great! Like wise the applique if you are up for it!!! Talk about asking too much! Sorry, got so distracted by being irritated with my husband and being hallucinatory from lack of sleep that I didn't mention that THAT IS ONE CUTE FLIPPIN' BUBBLE. C-U-T-E.
That's a very cute little bubble! I love the idea of using the Cricut for cutting stencils. Wow, and my daughter has one! I'd like to try it, stenciling on a lining. another gorgeous little dress - I'm going to be in Dunedin in May so I'm going to pop into spotlight to get that freezer paper - although goodness knows when I'll ever get a chance to stencil - but hey, if you can find the time, surely I can. Cute as a button! The print really makes it special. Well, do I ever feel foolish!! I even commented on the post where you showed how you did these appliques. I must have been sitting up really late, or something, because I don't remember it!!! Thanks for taking the time to answer my question, though. I really like this technique. Freezer paper stenciling, oh yeah!